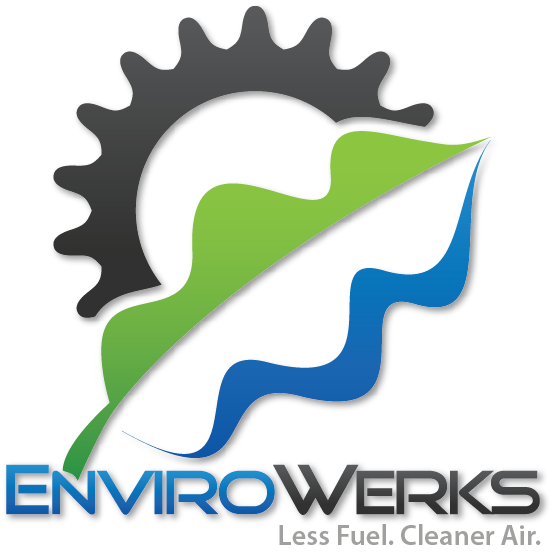 Envirowerks - Less Fuel. Cleaner Air. The initial product is designed as a retrofit for class 8 vehicles (primarily long-haul tractor trailers). It is a simple non-invasive installation which can be installed and configured by a diesel mechanic in about 8 hours. No permanent changes are made to the vehicle, and the control system ensures OEM engine specifications are not exceeded. The OEM engine software is not changed; instead our system is designed to monitor the output of the industry standard diagnostic link so it can operate in synergy with the engine. Our methanol reformer sips methanol, using only 1 gallon for every 1000 miles traveled. Our standard 7 gallon tank allows for about 6500 miles between refilling. Methanol can be commercially purchased and delivered from almost any chemical supplier in 55 gallon drums or in bulk. On-site filling stations can be installed much more economically than an equivalent natural gas station. Methanol can be made from domestic natural gas or renewable sources such as biomass. It is an excellent alternative to dual-fuel natural gas products which must be refueled every 400-800 miles and add significant weight to the vehicle. We operated our reformer for 1,500 hours in our shop without any problems. We've done stationary tests and limited dyno testing. Now we're looking for trucking companies to put our system through its paces on the road.